I'm into podcasts. If there is anything tedious on my todo list I usually throw on a podcast and the job seems to get done without much thought. This is why when I bought my first house and ended up with a lawn to take care of I went searching for a new pair of headphones. 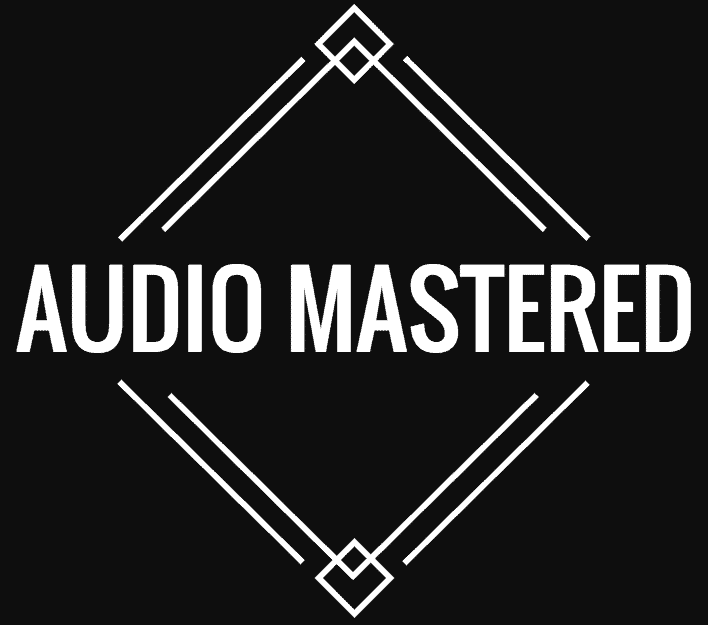 Most of the headphones I owned at the time were created for mixing and mastering music. Besides, I wasn't too keen on bringing a $300 set of headphones out to do my lawn work. If you want a workhorse that can provide you industrial level hearing protection then this is the best option on the market. They won't be as comfortable as regular headphones, and the sound quality won't be as great, but the hearing protection will be unbeatable. These will be more comfortable than the alternative method of placing your earbuds inside your other earmuffs and hoping they don't get yanked out. You don't really notice how loud you lawn equipment is until you put on a pair of these. Note that a lot of people had troubles setting them up, so it pays to read the instructions. They'll come on by themselves and are controlled through the volume on your phone. There's an auto-shut down if the headphones aren't being used for a certain period of time, so it won't run the battery down if you forget to turn them off. Conclusion: the best option for those looking for something that just works for mowing the lawn. A relative newcomer on the market, the SOtunes PRO earplug headphones are some of the best quality earplug headphones out there. 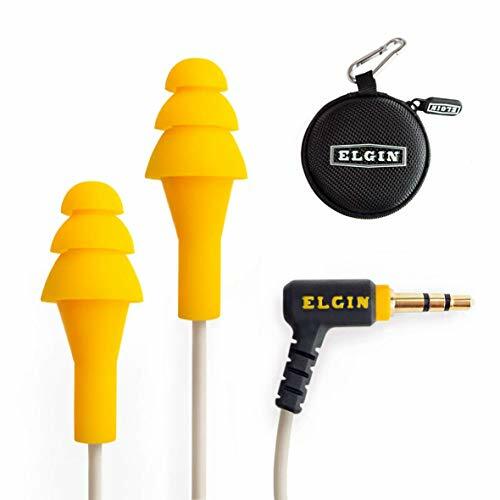 If you want the hearing protection, and don't want to blast you other earbuds at their max volume in order to hear the music then this is your best option. They will be more comfortable than any of the over-ear options. They will also be much easier to wear when things are starting to heat up. It's tough putting on a pair of over-ear headphones when the sun is blazing. They have a 10 hour battery life and have a 27dB NRR - which is the industry standard when it comes to hearing protection. They have lots of positive reviews on Amazon with only a few warranty issues. Conclusion: best for someone who wants earbud style headphones and wants to be able to hear the music over the lawn mower. 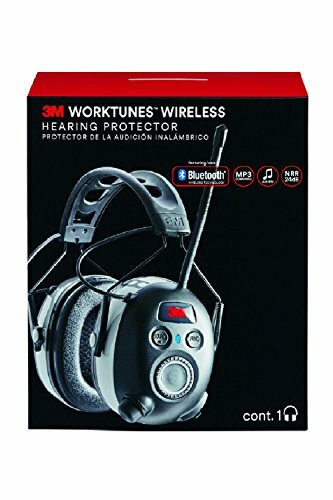 If you're like me and don't want to spend over $100 on a set of headphones that I will be using for yard work then these may be your best option. These are incredibly popular headphones. The have insane battery life and are incredibly comfortable. Because they are over-ear headphones they are going to offer a lot more in terms of sound isolation - however, they won't compete with the M3s I listed above. These are the headphones if you want something you can use for other applications other than mowing the lawn. The sound quality is incredible considering the price point and they're actually very light. My only concern is they won't provide the same hearing protection as the two above options. 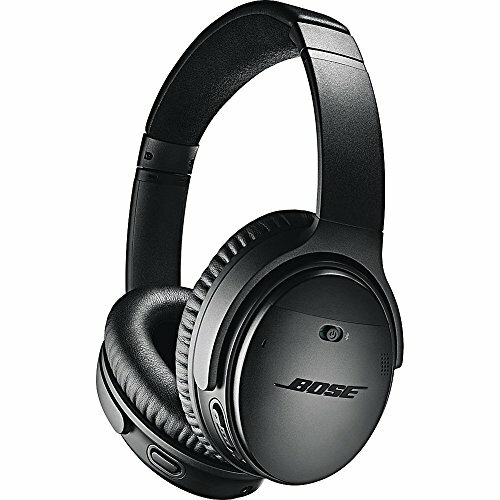 Conclusion: best for someone who wants a versatile headphone and doesn't want to spend over $100. On a budget and want something that just gets the job done? This is your best option. They're reasonably priced and will provide you industry level hearing protection. The sound quality won't blow you away, and they're nothing fancy, but they will cut the noise to a level when you can actually hear the music. Take it from me, you won't be able to use regular style earbuds for lawn mowing. You'd have to crank the volume so loud you'd be doing permanent damage to your hearing. The best quality of these headphones is their durability. They have a Kevlar strand cable - which is awesome for outdoor work. They also have a IPX6 rating, which means you can wear them in the rain (just don't submerge them completely under water). Conlusion: a great option for someone on a budget who wants something that won't break and just works. The premium option. Any audiophiles out there? If you want a premium option that will work for mowing the lawn then this is my choice. I love these headphones - and so does the general population. You've probably seen these headphones more than a handful of times. They're just so comfortable and the sound quality is just amazing. The reason I have them on my list is their noise cancelling feature. While earbud noise cancelling didn't work for me, over-ear noise cancelling actually works for mowing the lawn. It means you won't have to crank the music to compete with the mower. If you're concerned with sound quality, and have the finances to back it up, this is your best option. 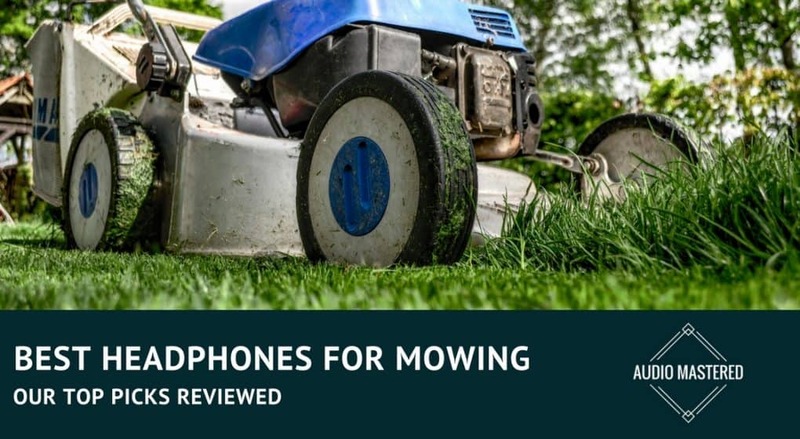 If you're not a headphone expert there are likely a few questions you may have when it comes to headphones for lawn care. This buying guide should help answer most of your questions. Should I Go With Earbuds Or Over-Ear Headphones? There are a few things we need to be thinking about when comparing over-ear headphones with earbuds. On the other hand, earbuds tend to do less well when it comes to sound isolation (especially when you consider passive sound isolation.) I first thought that using active noise canceling earbuds was the better option, unfortunately they failed completely. 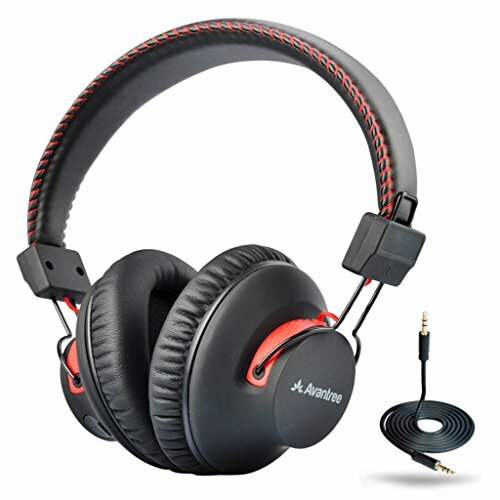 The sound quality isn't as good as the Aventrees, but they are only $30! A great set of earbuds for working around the house! I actually discovered them while researching headphones to use while riding my motorcycle. As you can see below, lawn mowers are typically around 90 db. That means, with an NRR of 25, you'll be brought down into normal conversation range. I'm very protective when it comes to my hearing. So blasting earbuds at max volume to compete with the lawn mower is not an option. It's either over the ear, or the earplug style earbuds shown above. This is one case where I think spending the extra money on getting Bluetooth connectivity is going to pay off. When you are mowing the lawn, the last thing you want to deal with is a cord getting caught and pulling on your headphones. Luckily, Bluetooth technology is actually really impressive these days. You're getting a functional battery life as well as no loss in audio quality. The only downside is you're going to have to pay a little more. If you're on a budget, then don't worry about it. But if you're going to be using the headphones a lot, it's something worth considering. Should I Really Be Concerned With Durability? If you think you'd prefer over-ear headphones, then I think you should definitely consider the different durability levels of headphones. Some headphones are just designed to be worn inside and don't come with components that can take a beating. You're going to want to look for a flexible headband as well as a replaceable cable if possible. I hate having to replace an entire set of headphones when the cable breaks. DJ headphones tend to be the most durable headphones on the market. They also are generally great in terms of sound isolation. How Can I Tell If A Set Of Headphones Is Comfortable Enough For Lawn Mowing? If you haven't owned a lot of headphones, it can be difficult to pick the winners from the losers without actually trying them on. Even I sometimes get it wrong. Sometimes, headphones just aren't going to work with certain head shapes. How Much Should I Be Spending Here? Over-ear Bluetooth headphones with decent sound isolation aren't going to be cheap (and you'll want to avoid them if they are.) But the good news is you will be able to use them for much more than mowing the lawn. Just think of how easy other lawn maintenance work will be if you are free from the dangling headphone cable!? However, you may be able to get away with cheaper over-ear headphones because they naturally have enough sound isolation to work with mowing the lawn. You will still have to pay a little extra for Bluetooth. The good news is, we're looking at under $100 for both types. So What Headphones Did I Buy For Mowing The Lawn? After a ton of research, I decided to pull the trigger on the Aventree Bluetooth headphones. These headphones have made themselves quite the reputation and I was just looking for an excuse to get my hands on a pair. There were 4 reasons why I bought them: 40 hour battery life, Bluetooth connection, super comfortable, and under $50. As I mentioned before, I don't want to be spending over $100 on a pair of headphones that I will be using for yard work. Fantastic. They are exactly what I was looking for. They connect easily, block out the noise, are fairly comfortable, and are lightweight. My only complaint is that they will be a little hot on really sunny days. But really, there aren't any other viable options. I tried with earbuds and they just won't work. Again, these headphones are incredibly popular and I expect you'd be able to use them for much more than just lawn mowing. 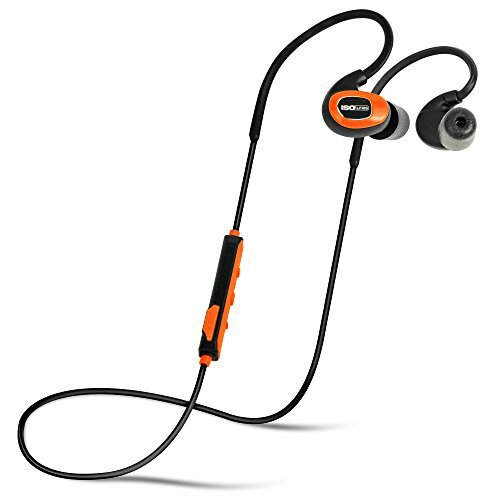 If you want to check out a few more headphones, here's my article on durable earbuds and here's my article on earbuds under $100. Enjoy! So there you have it. This is just one more example of how modern technology is making out lives easier with each passing year. I remember taking out my minidisc player and blasting my earbuds at full volume just to hear my music when mowing my families lawn. How things have changed! Have any other suggestions? Feel free to drop them in the comments below!